Used Hologic 4500C Elite For Sale. Refurbished, Pre-Owned & Reconditioned Bone Densitometers at Reasonable Prices. Used and Refurbished Radiology Equipment and X-Ray Equipment, Used and Refurbished Diagnostic Imaging Equipment, Used Cath Labs, Used C-Arms, Used MRI Systems, Used CT Scanners, Used PET Scanners, Used Nuclear Medicine Equipment, Used Mammography Equipment, Used Fluroscopy Equipment and Used Cardiology Equipment. Like new in stock in our located in our warehouse located in Ft. Myers, Florida. 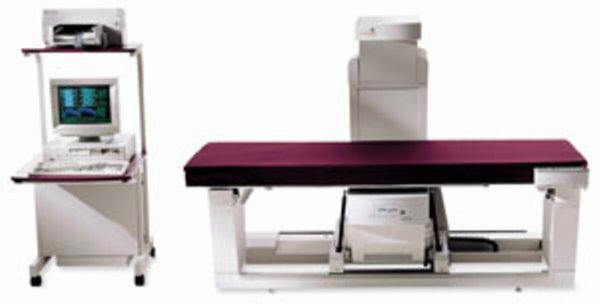 NHANES Reference Databaseselected by the International Committee for Standards in Bone Densitometry as the standardized hip reference data for the United States. Patient Rescan eliminates need to reposition patients. Saves time and assures patient comfort. Automatic Locate records and monitors the location of patient data saved to a storage media, eliminating the need to log patient data.